My name is Destinee Cushing with Destined To Be Vintage and I’m a swing dancer with a passion for vintage hair. Here, I’m showing you how to do a classic vintage style on someone else. I styled two victory rolls with a cascading curl and classic vintage curls on Tori’s hair. 1) Brush out hair and apply heat protectant if you have it. 2) Section off hair. Make a section for the bangs, more than usual bang amount. 3) Start curling 1” sections of hair with the curls facing down. 4) Secure curl on head with hair clip while still hot. 5) Repeat around whole head. 6) Leave curls pinned up until they are totally cool. This will maintain the curls very well. 7) Keep the bangs sectioned off for now, not curled. 2) Use a rat tail comb to section off hair on one side from end of part to ear. 3) Use a paddle brush to brush hair into one curl. 4) Tease hair generously in back of the section to create an anchor. 5) Hair spray teased hair, then gently smooth hair. 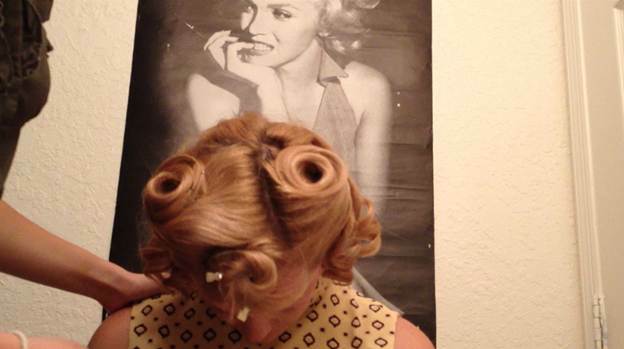 6) Extend curl completely and roll hair from the end to the base of the curl to form a pincurl. 7) Secure curl with bobby pins. 8) Smooth hair into victory roll shape. Make hair naturally flow into the circle made from the curl. 9) Anchor with bobby pins until hair feels secure. 10) Take some hair wax, rub between fingers and smooth over front of hair to contain any fly-aways. 11) Spray your victory roll heavily with hair spray. 12) Repeat steps 1 – 9 on opposite side of head. Try to make the rolls symmetrical. 1) Curl three sections of bangs in either direction, left or right. 2) Lightly tease each section. 3) Carefully smooth hair into one curl. 4) Spray hair with curl out-stretched and draped over the end of a rat tail comb. 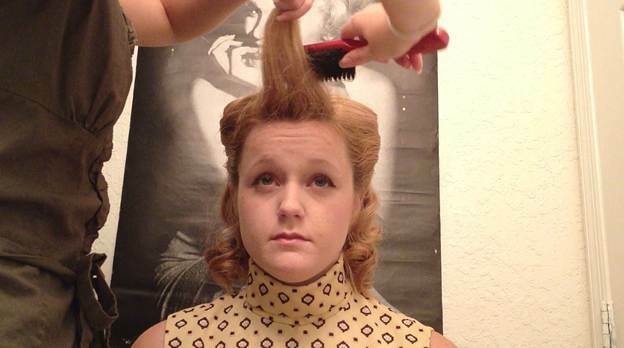 Hold until hairspray dries to set the shape. 5) Let the rest of the curl fall down and anchor it to the side of head with bobby pins. Make it look as natural as possible, as if it wasn’t pinned. 1) Dampen hands slightly with water to limit static and run fingers through curls, separating curls so they aren’t in Shirley Temple barrels. 2) Once your curls have the appearance you like, hair spray all the curls heavily. 3) Spray the whole style one last time. Add winged eyes, blush and red lips for a truly vintage look! 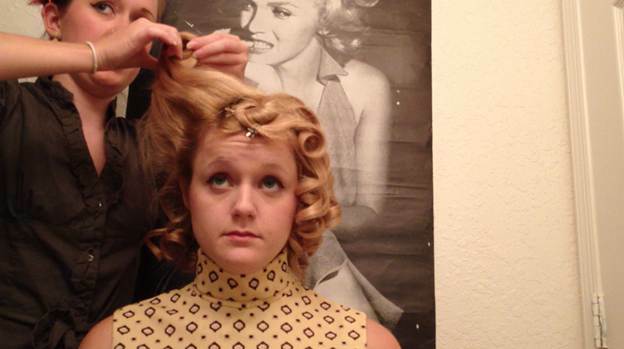 Destinee Cushing is a swing dancer who developed a passion for vintage hair. 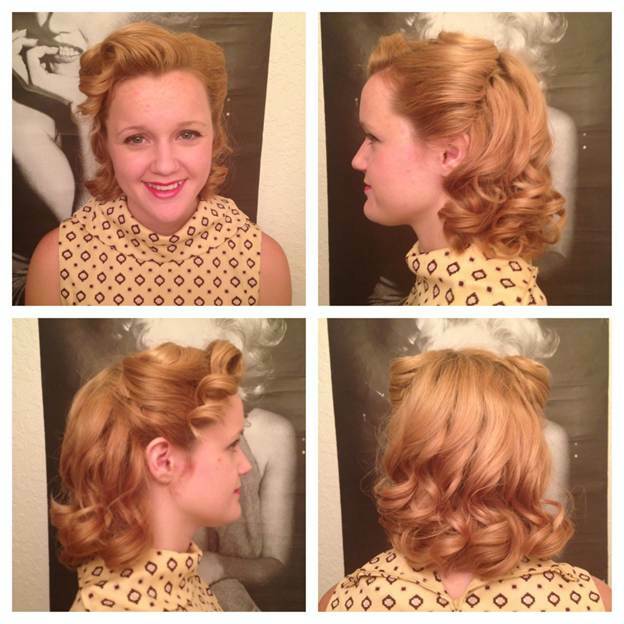 She specializes in styles from the 1920's - 1960's and loves teaching others how to achieve their own vintage looks.